In May of 2006 Fr. 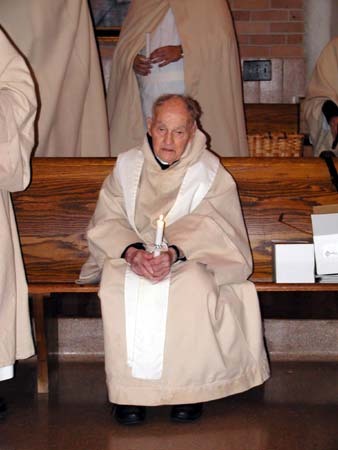 Francis, at the age of 93, slipped away into the arms of Jesus. In traveling up for his funeral I recalled all of the memories I had of him. I discovered that my entire spirituality, the very core of me, was deeply influenced by this man's life. Not so much by any profound words or explanations of doctrines, but by the integrity of his life and his persistent kindness. I like to think that he prays for us now as he did for so many years. It was in those pen pal letters that I found my love for prayer cards. I never realized that this gift came from knowing Fr. Francis. It never crossed my mind until after his passing. I desire to carry on his quiet work by sending our little prayer cards out in the mail each day. I believe that these little holy cards bring prayer, faith, teaching and hope to others; to the old and young alike. Eternal rest grant unto him O Lord, and let perpetual light shine upon him. May he and the souls of all the faithful departed, through the mercy of God, rest in peace. Amen.